PRINCE is my favorite artist of all time ... and yesterday I found out that he will soon be touring. I've seen him already in concert ... and would do it again! No questions asked! I just remember the hands and lights in the air, I was in church with a stadium of Prince fans, and my he can dance! .. And recently, I watched 'Purple Rain' and teased "he could strum me like his guitar!" 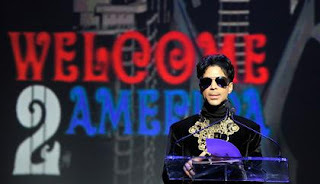 At New York's Apollo Theater, Prince has announced that he and his band, the New Power Generation will perform "a series of events," dubbed "Welcome 2 America" which will commence "on a purple day" in December 2010. The 52-year-old told concertgoers, "If you've been to one of my shows, then you know what time it is... you need to come early and come often because every time we play it's always something new. I got a lot of hits. Bring friends, bring children, and bring foot spray because it's gonna be funky." Prince says the shows will feature funk, R&B and jazz artists including Maceo Parker, Janelle Monae, Mint Condition, Esperanza Spalding, Lalah Hathaway, Sheila E., Cassandra Wilson and Graham Central Station.